World-class professional ice sculptors will compete at the Titanic Museum Attraction in Pigeon Forge, Tennessee this month as part of the museum’s kick-off to 2011. This unique, family-oriented special event at the World’s Largest Titanic Museum Attraction is free of charge. The Titanic Museum Attraction will host the outdoor ice carving competition on Saturday, Jan. 22 between 9 a.m. and 3 p.m. Visitors should arrive early for the best views of all the ice carving action. “This exciting one-day event will be produced by Titanic Pigeon Forge under the auspices of the National Ice Carving Association,” said John Joslyn, owner of the Titanic Museum Attraction. Professionals and amateurs will compete for prize monies ranging from $500 to $2,000. The official NICA Judging Panel will announce the competition winners and award prizes at 3 p.m.
“After watching these artists at work, people will want to stick around to see if their favorite sculptor is the big-prize winner,” Joslyn said. Although it has been open less than a year, the Titanic Museum attraction already is recognized as one of the Great Smoky Mountain Region’s top attractions; it draws approximately 100,000 visitors every month. Joslyn said. 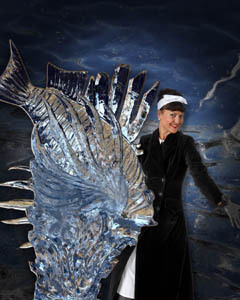 “Each of our special events in 2011 has been carefully selected for their entertainment and educational values as well as their ability to tie into and enhance Titanic’s rich legacy,” Joslyn said. The Titanic Museum Attraction is open daily at 9 a.m. Reservations are strongly suggested (many days sell out), or you may purchase tickets online at www.titanicpigeonforge.com or by phone at 800-381-7670.